Usually, given more time and money designers can provide Owners with a higher level of detail. Ultimately, more detailed construction drawings result in less unknowns and contractor change orders. Spending money upfront on higher-end, premium energy-efficient items can ultimately reduce operating costs. Work with your Architect to see where you can get your highest return on initial investment. Some times clients have preconceived notions on the outcome of their projects, which is fine (I like to collaborate), it actually helps us narrow down the look and feel of the project. However, the professional has undergone many years of training in most cases 8-10 years before earning a license to practice Architecture. If you are serious about your project you should stay flexible and strongly consider your Architect’s suggestions to help work toward achieving the best design possible. Whether it’s a small project or a large one and whether it’s a new build, repair and restoration, or alterations and renovations it is important to have the continuous support of your Architect. The money you spend on professional services will likely pale in comparison to the change orders that may result if the Architect is not involved. Since the Architect has liability, the Architect will be the strongest advocate for the Owner while working with the Contractor to ensure that the intent of the design is upheld. Sometimes it’s OK to blend in and sometimes it is not. If you want to stand out and be noticed, try to let loose and work with your Architect to come up with something fresh and exciting. Great design doesn’t necessarily have to cost more money. Teamwork is extremely important in design and construction because getting a high-performance project requires that builders challenge conventional ways of doing things. Integrated design focusing on a holistic design approach can include what Builders and Architects call a “charrette,” a meeting or series of meetings bringing together the designer, builder, and subcontractors to discuss the project and swap ideas. This approach is much more successful and can save the Owner money since the team is working towards a common goal instead of protecting each entity’s own interest. A well documented set of construction drawings NOW decreases additional “hidden” construction costs LATER! How Can Architects Produce More Effective Construction Documents? How Can Architects Generate More Work and Make More Money? Role: Senior Project Manager – Concept through design development. Formerly named Finley Hall, Conrad J. Schmitt Hall has been renovated and now houses several departments within the College of Humanities and Social Sciences. The project consisted of a complete renovation of 37,000 S.F. of an existing two story building down to existing structural elements and the addition of a third floor. The total area of the building has been increased to 52,700 square feet. There are new classrooms on the first floor, faculty offices on the second floor, and general purpose classrooms and additional office space on the third floor. The project also included construction of a new entrance tower, a new elevator on the south side of the building and a new exterior wall system. The cost of this project was $18M. For more information about tis project click here. View a panorama of the Sinatra Hall exterior. View a panorama of the Sinatra Hall interior. Frank Sinatra Hall is Montclair State University’s newest residence hall, which opened in the Fall 2010. Located along Clove Road on the western edge of the campus, Sinatra Hall is a six story residential facility containing 303 beds. My Role: Senior Project Manager for the Architect during the Schematic Design Phase. This project is a new 42,000 SF Travel Plaza building housing food and beverage as well as retail concession, restrooms and tourism center. The project incorporates numerous energy and water savings techniques. The project is registered with the USGBC and will be seeking LEED certification when complete. More information available at Architect’s website and the Owner’s website. The John J. Cali School of Music is an adaptive re-use project that transforms a former dormitory and classroom building into a state-of-the-art teaching, practice and performance facility, and creates a new “gateway” building for the campus. Built in 1928 in the Spanish Mission Style, the building originally known as Chapin Hall served as a dormitory until a later renovation transformed it into a classroom and departmental office facility. 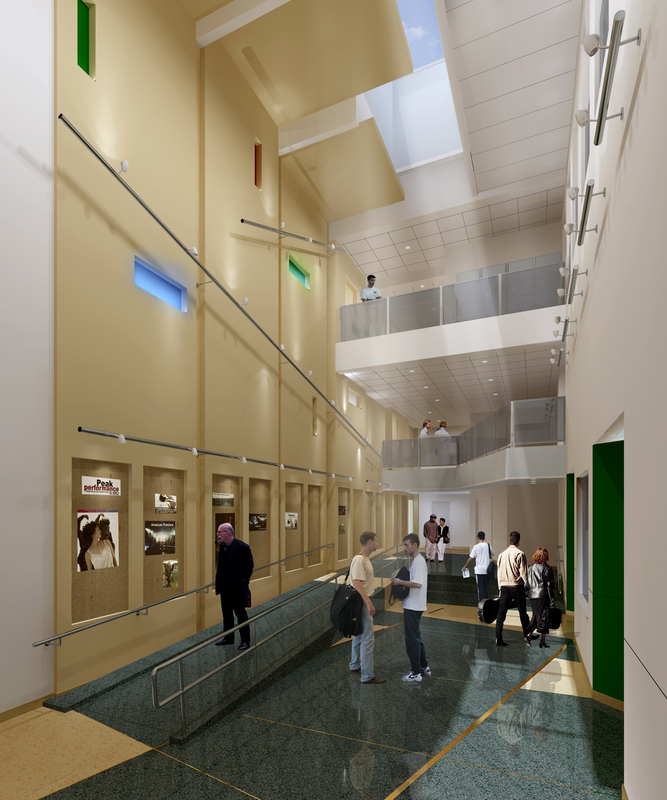 In 2005, the University commissioned RMJM Hillier Architecture to renovate and expand the original structure to establish a new home for the John J. Cali School of Music. The program calls for a 250-seat recital hall; teaching studios; music practice and rehearsal rooms; and faculty offices. Another goal of the project is to comply with a Certification Level according to the U.S. Green Building Council’s Leadership in Energy & Environmental Design (LEED) Rating System. To accommodate the program, the design proposes a new 23,000-square-foot, 2-story addition to the original 5-story, 29,000-square-foot structure, for a total of 52,000 square feet. The need for superior acoustics required the design team to overcome several challenges posed by the building’s existing tight floor-to-floor heights and older mechanical systems. Practice rooms and teaching studios are designed as a “box within a box” for acoustic isolation from other rooms. Innovative HVAC design accommodates the low floor-to-floor height (9’8”) of the building for superior soundproofing and optimal humidity and temperature control. Exterior renovations to the building reorient the main entrance to face College Avenue, a major thoroughfare on campus, rather than the quadrangle, where the original entry was located. The new façade offers a picturesque interpretation of the original Spanish Mission Style and provides a formal gateway to the campus. Check out the Photos from the opening event and a multimedia tribute to the Calis, who donated $5M towards the School of Music. My Role: Senior Project Manager for the Local Architect – Involved in the project from concept design through construction and post occupancy. Montclair State University’s Student Recreation Center has been selected as a winner of the Innovative Architecture and Design Award by Recreation Management, a magazine that features and recognizes distinguished sports, recreation, and fitness facilities. The May 2010 issue of Recreation Management recognized the Student Recreation Center as one of nine unique recreation centers across the country that showed outstanding design, and led in solving design problems in innovative ways. Read what Recreation Management had to say about Montclair State’s Student Recreation Center in their article.